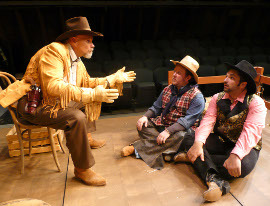 Partnership: “Make Me A Cowboy”…..
"Just to tell you how much we enjoyed producing "Make Me a Cowboy" at the Jones theater in Westcliffe CO. We opened our summer 2011 season with it. The audience loved it and sang along with the songs. It was a great success and a feel good show. Thanks for writing it, we really had a good time with it at the Jones Theater." The new western musical comedy “Make Me A Cowboy” will have you laughing and singing all through the night! "Make Me A Cowboy” is set in Kansas, the late 1880's, on a ranch known as “The Jumpin’ J”. The railroads are running full-steam, forcing cowboys out of the herding business, placing the entire ranch in danger of closing its doors forever. The ranch owner and his wealthy brother (both hailing from St Louis) devise a plan to keep the ranch financially afloat: Instead of herding cattle, they will herd eager city slickers (for a wee fee, of course) into a no-hold’s barred, true-grit education on the cowboy way of life! That’s right, for a small price, city folk can actually learn how to be real ranching cowhands! The cowboys at the Jumpin J have put together and rehearsed a show to enlighten, endear and educate: a performance to show all what it’s like to be a genuine cowboy! However, cowhands aren’t playwrights and though they planned this extravaganza to the best of their abilities, mishaps and unplanned shenanigans force these cowboys into a whimsical ride of impromptu, fly-by-the-seat-of-their-pants action! If you liked "Smoke On The Mountain" you are going to love "Make Me A Cowboy - A New Western Musical Comedy"
Please feel free to contact me with any questions you may have. I would love to discuss the possibility of how “Make Me A Cowboy – A New Western Musical Comedy” could be a part of your theatre’s schedule. An Accompaniment CD which has the full score and all the instruments added, is now available. If interested in receiving a revised perusal copy of the script and a demo CD of the music please contact me. 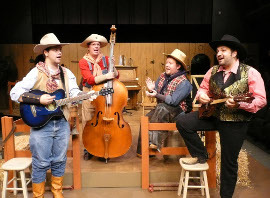 Jon Schweppe, Roger Akers, Bryan Woods, and Nicholas Wallbusser in Make Me a CowboyThe Playcrafters Barn Theatre's Make Me a Cowboy will appeal to anyone who likes pure, wholesome, clean-humored comedy that's light on plot and heavy on friendly cowboys and public-domain cowboy-themed songs. While that "anyone" does not include me, I at least recognize the earnestness in playwright and director Don Bailey Bryant's effort to present a decent show, and Make Me a Cowboy certainly made for a good time for Friday's audience, many of whom sang along to a good number of ditties and seemed pleased with the production. The show, which is set in the 1890s, is overtly simple, centered on a group of cowpokes and herders singing and telling stories in an effort to save the Jumpin' J Dude Ranch. Their performances are sold as being part of a weekend retreat for Easterners - meaning the audience members - to learn how to be cowboys. Woven into that plot is an engagement between a herdsman and the ranch owner's daughter, one threatened by the cowboy not asking his potential bride-to-be's father for permission to marry his daughter. There is a lot of exposition in Bryant's script; he takes quite a bit of time explaining characters, the situation on the ranch, and the fact that we're at a retreat. The engagement plot, meanwhile, isn't introduced until about two-thirds of the way into the first act, and while the father-of-the-bride subplot is introduced shortly thereafter, there's still exposition regarding his character a few scenes into the second act. The cast, far more often than not, matches the happy tone of the script, and even the characters' dirtiest digs at each other seem to be made in good fun. (Their threats of shooting one another had me expecting someone to pull out a squirt gun rather than firing bullets.) All of the eight actors are noteworthy for some aspect of their performances, though a few do stand out. Tom Naab's Alistair, the highfalutin brother of the ranch's owner, couldn't be more amiable, and is most amusing in his stumbling, drunken state. Janell Just adds just enough hints of tomboyish-ness to make it clear that her Annie, who's just returned to her father's ranch from finishing school, isn't quite finished. Jon Schweppe offers the most nuance of the bunch, with his Tommy's overprotective frustration at Annie's engagement. 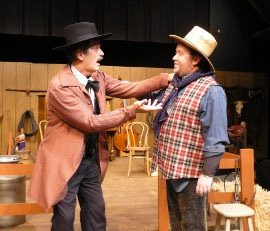 And Bryan Woods wipes away all of the condescending, grandly postured, clear and crisp diction that made his turn as Pozzo in 2010's Waiting for Godot at the Harrison Hilltop Theatre unmissable, portraying his cowpoke Knuckles as a likable oaf with a delightful drawl. With such a minor plot and only minor variance in the characterizations, I couldn't help but let my mind wander a bit, imagining how the script would play with actors portraying grittier, more realistic cowboys. My conclusion: I'm not sure Bryant's words would work in any other way than with clean, amicable, cheery cowhands speaking them. Plus, on top of the amiability of the piece, there's also a sense of familiarity to the show that's pleasing. While I couldn't sing along with my fellow audience members on most of the numbers, I did at least know a few of the tunes, and the feel of the musical inspired pleasant memories of theme-park performances and church pageants from my youth.